I love good food. But anyone who knows me personally will vouch for the fact that I’d rather be outside the kitchen that in it. However, I find that my love for good food takes me to the kitchen more often these days. While I try to replicate some of my favourite dishes that I eat out I also keep an eye out for refreshing recipes that can easily be put together to give a gourmet angle to a home-cooked meal. One such recipe that I have followed umpteen times is a side dish of broccoli, red chillies and slivered almonds, served chilled. 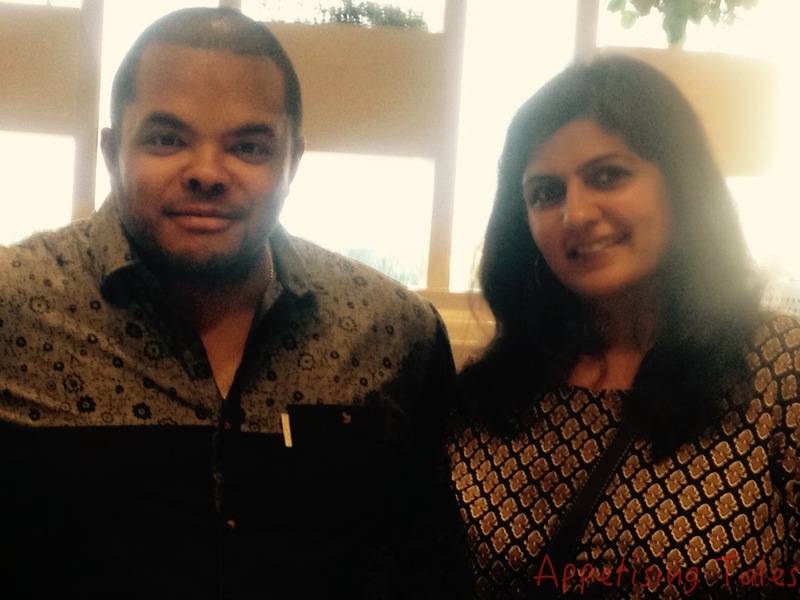 I had seen it on Everyday Exotic, a food show hosted by Canadian chef Roger Mooking, aired on TLC. Roger is currently in Delhi to launch the first Indo-Canadian cookbook that has been put together by the Canadian High Commission, featuring recipes by Roger himself and Indian celebrity chefs Sanjeev Kapoor and Manisha Bhasin, among others. An Appetite for Fusion will be unveiled Canadian High Commissioner, Nadir Patel on March 19. The event is co-presented by Delhi Gourmet Club. 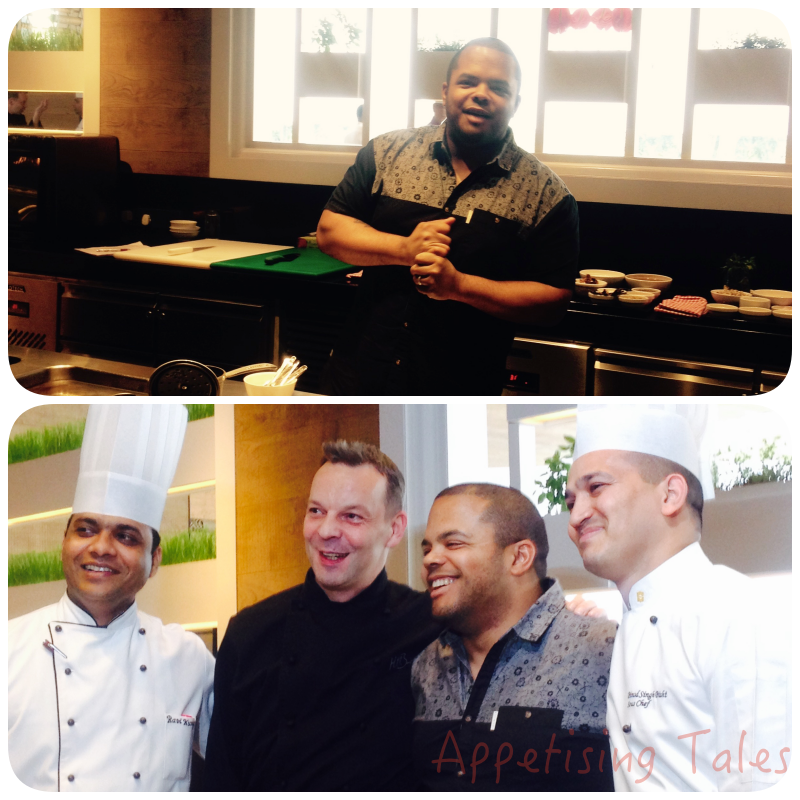 Top: Chef Roger Mooking; Bottom: Chef Roger with the Shangri-la team. - Use a combination of minced garlic and chopped garlic as a marinade for meats. The different sizes allow the garlic to permeate the meat entirely as well as form a caramelized crust on top. - While grilling any meat it is advisable to not disturb it too often. Initially the meat will stick to the grille but once the crust starts forming it’ll start peeling off on its own. - Blanching black eyed peas helps to release the gas from them that then doesn’t get transferred to the dish. - While sautéing onion and garlic add a little salt to draw out the moisuture slightly. This will prevent it from burning. - Adding a citrus element to any dish, sweet or savoury, opens up the flavours. The acid opens up the palate allowing the flavours of the dish to be enjoyed more fully. While using ingredients such as coriander and tamarind Roger confessed to enjoying the fact that he didn't need to explain each ingredient to us unlike in North America where most people are not too familiar with the correct use of these ingredients. 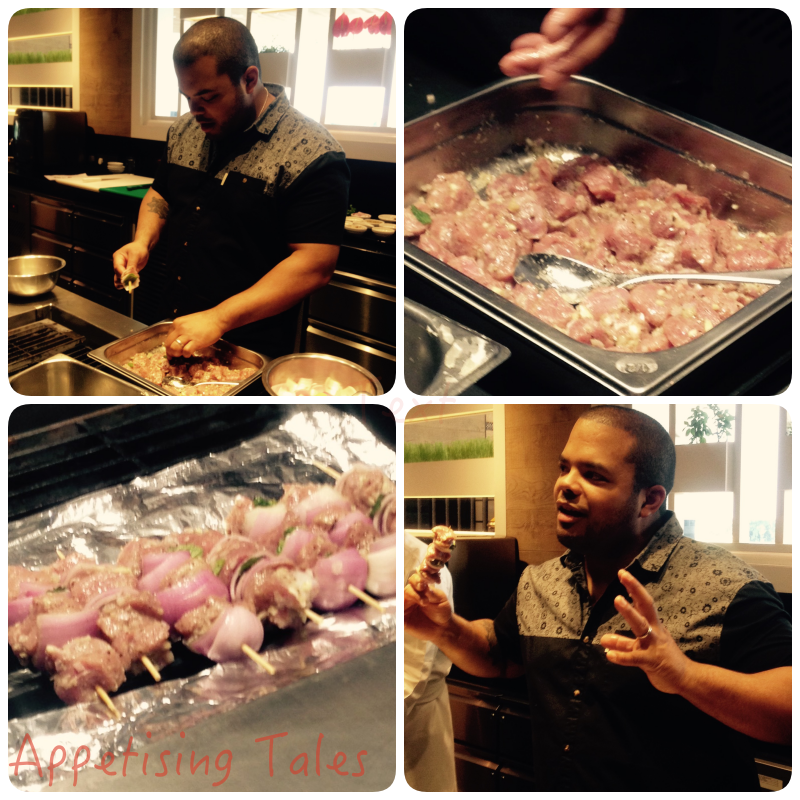 Chef Roger prepping the Lamb Kebabs. “Food is a way for the world to come together,” says Roger. Being in born in Trinidad, attending cooking school in Toronto, having a Chinese grandfather and close affiliation with a Telugu family is just a part of Roger’s multi-cultural influence that finds its way into the fusion fare that he serves in his restaurant. “When cooking fusion food, it’s important to work with a few ingredients, lest there is con-fusion!” he laughs. Hi Shibani, it was lovely meeting you at the event. Your blog lives up to its name. Look forward to reading more of your adventures in food. Hi Shivani, thanks for writing in. I look forward to meeting you at more foodie events. Thanks Puja! Yes, some of these tips are really simple, but good to know. I will continue posting more tips and hopefully some recipes too. So do keep an eye on Appetising Tales.